Bolts from AGD are made from hardened stainless for extra long life. This is the foamie style. Bolts from AGD are made from hardened stainless for extra long life. This one is the Foamieless Style. The Bolt Spring fits all AGD markers regardless of age or type. They are made from very special square wire so they don't fold inside themselves when collapsed. Replace your old springs when they sag below the front of the bolt. This is a urethane washer that sits at the base of the power tube. When the bolt returns, it hits this to decelerate. Rubber foamies go easy on paint! These are replacements for the foamie bolt. Glue them in with superglue and let dry overnight. This is the most common size o-ring in the marker. Used in the Power Tube and the On/Off assembly. 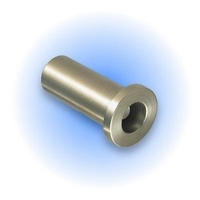 This item screws into the end of the Power Tube and is a precision part. It releases the air blast behind the ball in a controlled manner so the air hits the ball with low pressure to gently accelerate it out the barrel. Keeps the Power Tube Tip from loosening up. Now sold in packs of 3. Now sold in 2 pack. The very back of the marker has this adjustment nut to change your velocity. Made from high quality stainless steel. On the Flatline, the regulator nut adjusts the output pressure. The Regulator Piston has a built in blow-off valve that will leak air if your marker becomes over pressurized. The blow-off resets once your pressure goes back to normal. This safety feature is found exclusively in AGD markers. This O-ring goes around the Regulator Piston and is a wear item. Replace when the marker has erratic velocity problems and you have tried everything else. The Regulator Seat is the most abused part of the marker. It opens and closes with every shot and every piece of dirt in your air system eventually goes through it. air pressure in the chamber.